« How is a Komodo Dragon like Old Age? 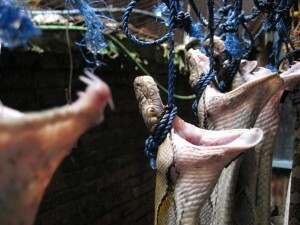 Spokeswoman for the Asia-Pacific’s People for the Ethical Treatment of Animals (PETA) Ashley Fruno said the rally was held to follow up the organization’s investigation, which found that millions of animals such as snakes, lizards and crocodiles were poached, netted and killed in Indonesia cruelly to produce fashion items such as boots, belts and handbags. “People must know this and stop buying fashion products made from such material,” she told reporters. Dressed in grim reaper costumes with hoods, masks and scythes, the activists planned to rally in front of the Hermes counter in nearby Pacific Place mall but were forbidden by the mall’s security guards. In its press release, PETA said leading shoe producer Nike, along with its affiliate Cole Haan, and international fashion store H&M had agreed to stop selling products made from exotic animal skin. It is now calling on companies such as Hermes to end the sale of these products too. This entry was posted on Wednesday, April 7th, 2010 at 11:31 am	and is filed under Law and Policy, Principles, Reptiles, Skin Trade. You can follow any responses to this entry through the RSS 2.0 feed. Both comments and pings are currently closed.